ichige 一夏（いちげ）lit. 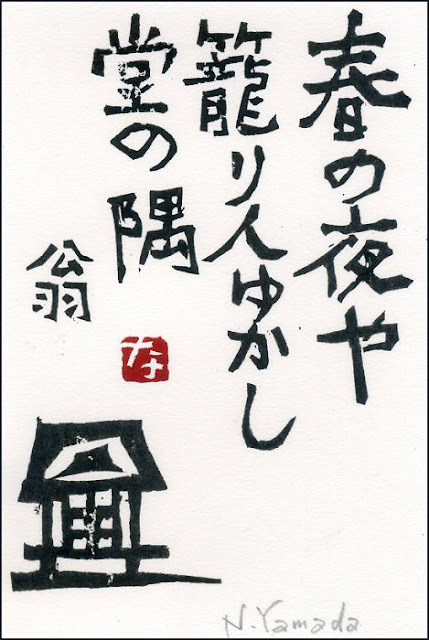 "one summer retreat"
gedachi 夏断 (げだち) "summer abstinence"
not eating red meat, not drinking alcohol, staying home reading the sutras and copying them.
. gekyoo 夏経（げきょう） copying the sutras in summer . Every day new flowers are offered. This is done at the temples, but can also be done at home for the family altar. 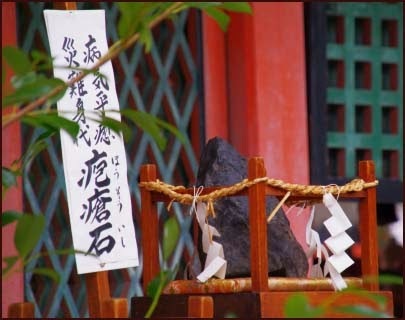 The origin of this custom dates back to the Heian period, where offerings were made at the Western Tower of temple HieiZan, Kyoto.
. gege 解夏 end of the summer ascetics . is a Japanese term for a three-month period of intense training for students of Zen Buddhism, lasting anywhere from 90 to 100 days.The practice during ango consists of meditation (zazen), study, and work (samu). Ango is typically held twice a year, the first period from spring to summer and the second period from fall to winter. The word ango literally translates as "dwelling in peace"; the summer ango is referred to as ge-ango and the winter period is u-ango. Additionally, some monasteries and Zen centers hold just one ango per year. "Many centers now allow members to attend retreats on a part-time basis. Many have ango, a three-month long period of intensified practice, that members can participate in while continuing to go off to work during the day." Taigen Dan Leighton writes a more traditional definition, "These are ninety-day training periods of concentrated practice without leaving the monastic enclosure (except for monks going out for necessary temple business). They date back to the summer rainy season retreats of Shakyamuni's time. 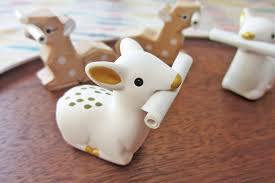 In Japan, they have been held twice a year, summer and winter." 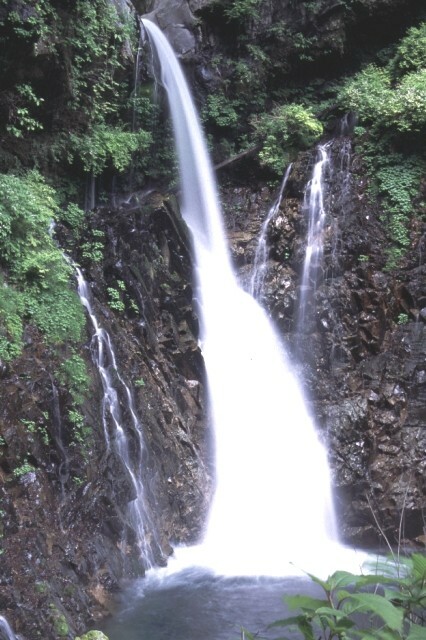 Urami no taki 裏見の滝 - 裏見の瀧 "Back- view waterfall"
near Nikko, with a cave behind the waterfall for mountain ascetic practises. When Basho spent time behind the waterfall, he could not hear the hototogisu any more and felt this as URAMI.
. Fudo Myo-O 不動明王 statue at Urami .
. Temple Hasedera 長谷寺 . for summer retreat writing . . . 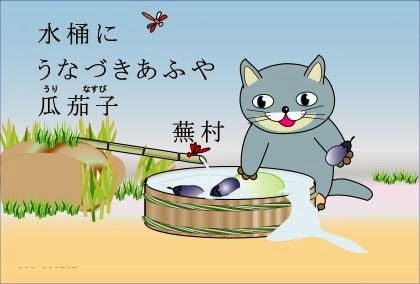 This summer hokku is from the 4th month (May) in 1822, when the summer retreats (夏 ge, or 夏安居 ge-ango) are getting underway at various Buddhist temples. 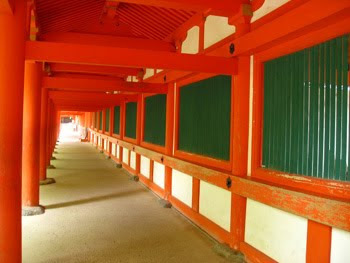 Following a custom that began in ancient India during the Buddha's lifetime, in Japan, too, monks and laypeople gather at temples and concentrate on prayer, chanting, meditation, and study during the rainy season in early summer. The retreats usually began on 4/8, the birthday of the Buddha, and could go on for as long as 90 or a hundred days. 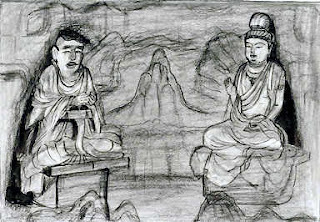 Issa seems to have visited a temple on 4/8 or a little later, and in the privy he sees a poem or poems brushed on the wall. Uta usually refers to a waka or a kyoka, a humorous "crazy waka," and it could be either one here. Evidently the poem refers to one of the Buddhas or is inspired by Buddhism, since Issa takes it to be legitimate summer retreat writing (ge-gaki 夏書). 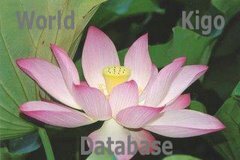 Summer retreat writing usually referred to calligraphically writing the name of a Buddha, especially Amida, or to copying out sutras, but this humble poem, perhaps humorous, obviously expresses deep spirituality.
. WKD : Summer Flowers . ka (songs), bu (dance), and ki (skills). But it actually derives from the classical Japanese verb kabuki meaning "to incline." It also carries the meaning of something eccentric or deviating from the norm. The action in kabuki plays commonly revolves around Buddhist notions such as the law of retributive justice and the impermanence of things. Confucian traditions of duty, obligation, and filial piety are also expressed on stage. Historically, kabuki performances have been "off-beat," employing flamboyant costumes, elaborate makeup, and exaggerated body movements to create a sense of the spectacular. This may sound strange to those who imagine that Japanese people highly value harmony and conformity in society. It is ironic that many Japanese people take pride in kabuki as being one of Japan's cultural treasures, but similar eccentric behavior in actual life is highly disapproved of. 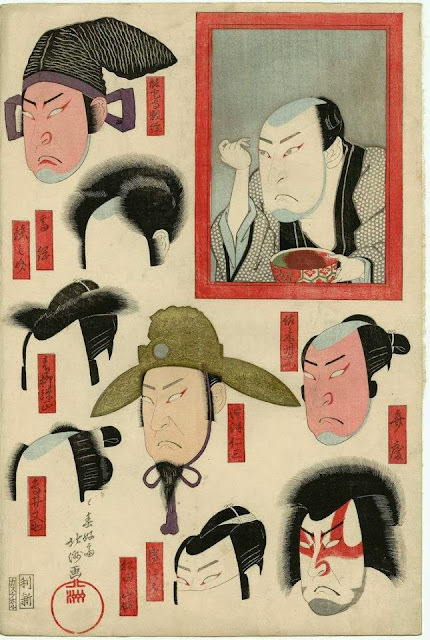 in the dressing room mirror, with wigs and makeup for various roles"
Kyogen (literally "mad words" or "wild speech") is a form of traditional Japanese theater. 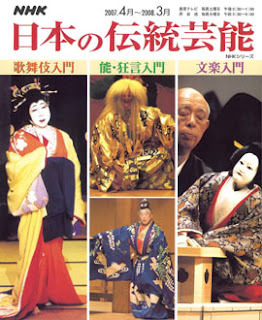 It developed alongside noh, was performed along with noh as an intermission of sorts between noh acts, and retains close links to noh in the modern day; therefore, it is sometimes designated noh-kyogen. However, its content is not at all similar to the formal, symbolic, and solemn noh theater; kyogen is a comical form, and its primary goal is to make its audience laugh. The lower actors had to prepare tea for their elders, and this has been made into a theabar performance. The most popular performances in this season were "Sukeroku", "Kagamiyama Kokyô no Nishikie"" and "Sendai Hagi". Nagahama is an old town on the shores of Lake Biwa. 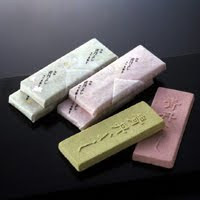 The festival dates back to the time of Toyotomi Hideyoshi, who after many years finally became a proud father of a son. 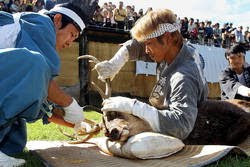 He presented gold dust to the villagers of Nagahama, where he lived at that time. 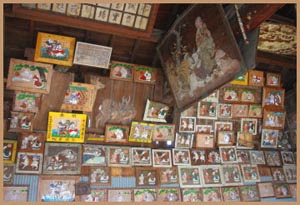 The villagers used the gold dust to decorate their festival floats (hikiyama). The estival floates have children from 5 to 12 years in bright costumes on board, who perform comic performances (kyoogen). The floats are carried around town and to the shrine Hachimangu. Bon-Kyogen performed on the 16th of July, at the temple Hoozaiji 広済寺 in Chiba. It is performed by the lay people of the parish. a term used in kabuki parlance for performances given by actors during the ninth and tenth months, corresponding to the last part of the theatrical year before some actors were scheduled to go on tour in other cities for the next season. Related terminology could sometimes be complicated. 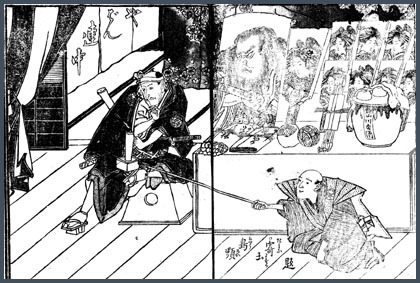 Actors departing Osaka for Edo were referred to as kudari yakusha ("going-down actors"). 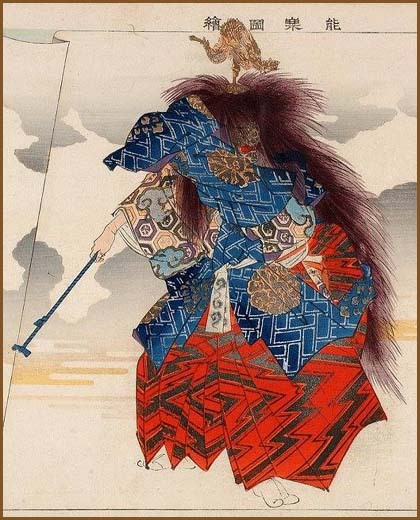 When actors took the opposite route for their tours and left Edo for Kamigata (the Osaka-Kyoto region), they were, in Kamigata, referred to as nobori yakusha ("actors going up to the capital") or 'Edo nobori' ("going up to the capital from Edo"), although in Edo they were called agari yakusha ("going-up actors"). 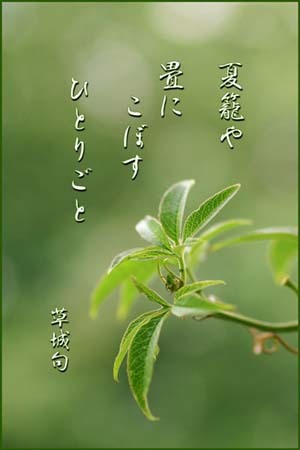 Terminology for onagori kyôgen also varied, as in Edo these plays were occasionally called aki kyôgen ("autumn plays") or kikuzuki kyôgen ("chrysanthemum-month plays") because they coincided with the Chrysanthemum Festival (ninth day of the ninth month to the fifteenth day of the tenth month). Typically such performances included episodes from popular roles as well as dances created for the special occasions. Other plays that were commonly found in onagori kyôgen included those involving kowakare or 'child separation' scenes in which a parent was forced to abandon a child, a choice of subject obviously linked to the sadness felt by theater fans who were forced to say farewell to their favorite actor before his journey.
. Kaomise 顔見世 "Showing the Faces" . the name of a Kyogen play "The Tea Seller". This seller is disturbing the Gion Matsuri festival rehearsals. 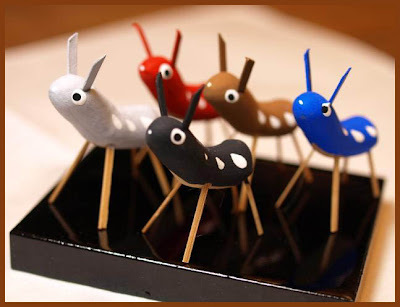 He mimics a dance with a little double-headed drum (kakko (羯鼓 or 鞨鼓) . Think of freedom as a dog that feels free to run around a fenced garden. It feels satisfied because it is not stuck in the house, even though it doesn't have the freedom to go outside the garden. Freedom exists inside the garden as well as outside. posture, gesture must come from the overflowing heart . 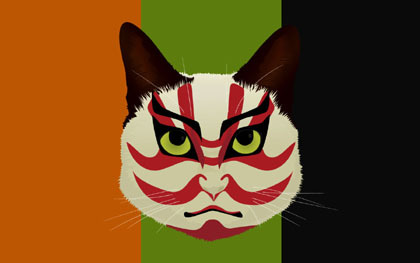 make-up used in the Kabuki theatre.
. Cats and Daruma with Kumadori ! .
. Nomura Mansai 野村萬斎 (1966 - ) . The tea house was a place where the visitors would have a cup before going to the theater.
. Nakamura Kanzaburo 中村 勘三郎 . ***** . Irumagawa 入間川 River Iruma - Kyogen .